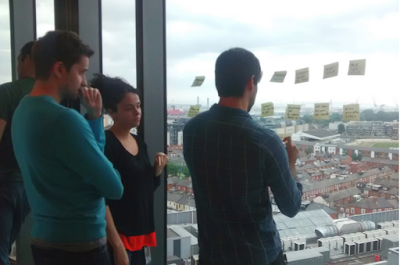 Last year we launched the "Note from your reviewer" feature in our reconsideration process. This feature enables us to give specific examples and advice tailored to each case in response to a reconsideration request. Thus far in 2015 we have sent a customized note to over 70% of webmasters whose hacked reconsideration request was rejected, with specific guidance on where and how to find the remaining hacked content. The results have been encouraging, as we've seen a 29% decrease in the average amount of time from when a site receives a hacked manual action to the time when the webmaster cleans up and the manual action is removed. We have also completed our second #NoHacked campaign, with more detailed help on preventing and recovering from hacks. In the campaign, we focused on ways to improve the security on your site as well as ways to fix your site if it was compromised. You can catch up by reading the first post. Last year we launched the "Fetch and Render" feature to the Fetch as Google tool, which allows you to see the website exactly as Googlebot sees it. This functionality is useful in recovering from a hack, since many hackers inject cloaked content that's not visible to the normal user but obvious to search engine crawlers like Googlebot. This year we also launched the Hacked Sites Troubleshooter in 23 languages which guides webmasters through some basic steps to recover from a hack. Let us know if you have found the troubleshooter useful as we're continuing to expand its features and impact. Finally, we're beta testing the automated removal of some hacked manual actions. 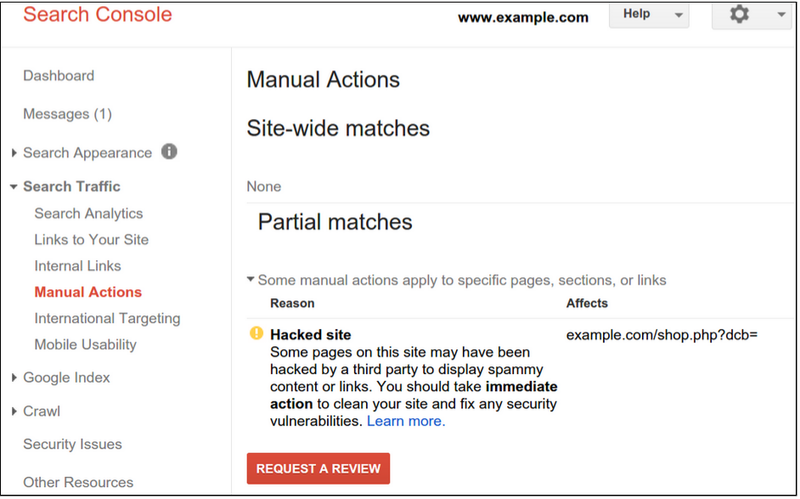 In Search Console if Google sees a "Hacked site" manual action under "Partial matches", and our systems detect that the hacked content is no longer present, in some cases we will automatically remove that manual action. We still recommend that you submit a reconsideration request if you see any manual actions, but don't be surprised if a "Hacked site" manual action disappears and saves you the trouble! Our improved communication and tools have come directly from feedback we've collected from webmasters of sites that have been hacked. For example, earlier this year we hosted webmasters who have been through the hacked reconsideration process in both Mountain View, USA and Dublin, Ireland for brainstorming sessions. We also randomly sampled webmasters that had been through a hacked reconsideration. We found that while only 15% of webmasters were dissatisfied with the process, the main challenges those webmasters faced were in clearer notification of their site being hacked and clearer guidance on how to resolve the hack. This feedback contributed directly our more detailed blog post on hacked recovery, and to much of the content in our latest #NoHacked campaign. We will continue to support webmasters of hacked sites through the methods detailed above, in addition to the Webmasters help for hacked sites portal and the security, malware & hacked sites section of our forum. And we'd love to hear your ideas in the comments below on how Google can better support webmasters recovering from a hacked website!
. When your site has a manual action taken, you can confirm in the [Manual Actions] page in Search Console which part of your site the action was taken and why. 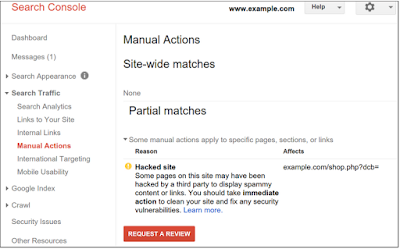 After fixing the site, you can send a reconsideration request to Google. Many webmasters are getting their manual action revoked by going through the process. and mobile-friendly web pages. 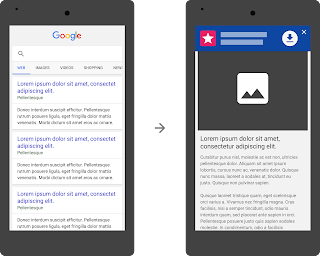 However, sometimes a user may tap on a search result on a mobile device and see an app install interstitial that hides a significant amount of content and prompts the user to install an app. Our analysis shows that it is not a good search experience and can be frustrating for users because they are expecting to see the content of the web page. App install banners are supported by Safari (as Smart Banners) and Chrome (as Native App Install Banners). Banners provide a consistent user interface for promoting an app and provide the user with the ability to control their browsing experience. 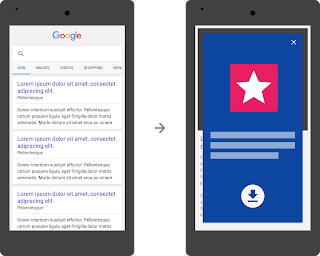 Webmasters can also use their own implementations of app install banners as long as they don’t block searchers from viewing the page’s content. If you have any questions, we’re always happy to chat in the Webmaster Central Forum. Posted by Daniel Bathgate, Software Engineer, Google Search. When it comes to search on mobile devices, users should get the most relevant answers, no matter if the answer lives in an app or a web page. We’ve recently made it easier for users to find and discover apps and mobile-friendly web pages. However, sometimes a user may tap on a search result on a mobile device and see an app install interstitial that hides a significant amount of content and prompts the user to install an app. Our analysis shows that it is not a good search experience and can be frustrating for users because they are expecting to see the content of the web page.